POSTMASTERS ARE SET to protest in Dublin this afternoon over the closure of 159 Post Offices around the country. The march follows the closure of several outlets in recent weeks, amid significant upset in rural communities. The Independent Postmasters Group (IPG), which is organising today’s demonstration, is calling on the Government to implement a 2016 private members motion to put a five-year stay of execution on any closures. They say this would give the group time to come up with new products aimed at enticing more customers to use the network. One such idea is a non-profit community bank. This would provide low-interest mortgages and funnel any profits back into the community. Speaking to TheJournal.ie chairman of the IPG Tom O’Callaghan said it could save people thousands of euro in the long run. If you take a €315,000 mortgage on a 30 year loan, you could potentially save €4,000 a year on interest. The protest overlooks the fact that An Post is expanding its range of financial services and early in 2019 will have comprehensive and competitive personal loan and credit card offerings for customers, both personal customer and in the SME sector. It’s a sentiment backed by the Irish Postmasters Union also. In a statement the group said community banking is not a panacea for the challenges faced by the Post Office Network. 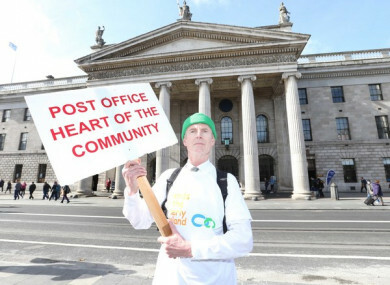 IPU General Secretary Ned O’Hara said “while that today’s Post Office Dáil march was heartfelt and well-intended, its organisers were misleading communities in presenting ‘community banking’ as one-fix-all solution for keeping non-viable Post Offices open”. Why can’t you sign on at your local post office? Or apply for your driving licence? The economic heart of rural Ireland is being ripped out. Today’s protest comes as several rural communities come to terms with the closure of their local post offices. On Friday Ballineen in county Cork saw its postmistress retire. Speaking to Patricia Messinger on C103’s Cork Today Show Finola O’Driscoll said they found out seven days after her father died in January that the post office faced imminent closure. He had worked as the community’s Postmaster for 44 years. We weren’t given the option for a family member to take it over. O’Driscoll’s mother took over the post office for six months but took redundancy last Friday. She said many in the community think they closed the shop by choice, but she said that’s not so. A lot of people in the community think it was voluntarily shut down, but it’s not. We supported each other for An Post and unfortunately they’re not doing the same for us. In a statement An Post said the closure of Ballineen will allow nearby outlets “boost their transaction levels and viability for the future”. The post office at Ballineen had been run for some months by a member of the O’Driscoll family on a temporary contract following the sad passing of our Postmaster colleague in January of 2018. The company goes on to say; “An Post decided not advertise a new post office contract for Ballineen and to close the office in line with our protocol on dealing with such circumstances. Our decision was based on a number of factors including population and the proximity of other offices”. An Post has faced significant backlash over the announcement to close so many outlets around the country. O’Callaghan said his members fear there will be many more on the cards. 231 postmasters have not been offered a new contract, so that means we’re potentially looking at 390 Post Offices being closed down. The IPG is also raising concerns about the long-term security of the new post office contracts. “690 Postmasters have been offered a new contract, a seven-year contract with no security of income after 2.5 years,” O’Callaghan said. He said it all hangs on whether or not next year’s Social Protection tender goes cashless or keeps the status quo of cash payments being made through Post Offices. The Department of Social Protection‘s contract amounted to €51 million in 2017 for 33.6 million transactions. The protest this afternoon will begin at Trinity College and make its way towards Leinster House, where O’Callaghan said they’d be happy to speak to Minister Denis Naughten in person. Email “Postmasters to march on the Dáil over closure of 159 Post Offices ”. Feedback on “Postmasters to march on the Dáil over closure of 159 Post Offices ”.